Why would you send a sample thank you letter after your phone contact? Some people when looking for a job will call to see if they can talk to someone in HR. This actually gets them some inside information on what if any job openings are available. Companies will promote from within most of the time for the non technical positions. Once they find out any positions they are immediately hiring for, well they have a slight advantage. Why? Well now this person can taylor their resume to fit the job opening. This gives them a slight advantage. So after the phone call it is obvious you have talked to someone in HR and sending them a thank you for the phone contact information is not only polite, but at the same time you also get to send along your resume to this same person. 1.So now you have a small insidehelper. 2.How? They will send it along to their boss, also letting them know that they talked to you the other day. 3.The conversation will start and if you left a good impression with your phone contact, well you just never know what might happen!! 1. While being polite and business like thank the HR person and include several top reasons showing you're a good candidate for the position. 2. Show your skills match the company job description and you enjoy that type of work. 3. You would really like the chance to go through their hiring process, written testing ect..
4. Afterwards you would like to come in for an interview. A one page thank you quick and to the point is best. 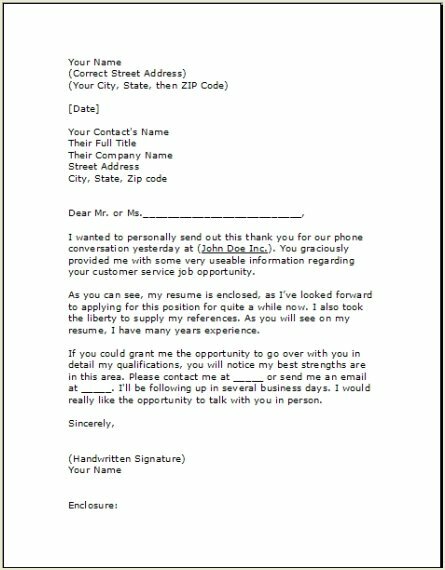 The follow up thank you letter after the phone contact is now where you also e-mail them your resume. 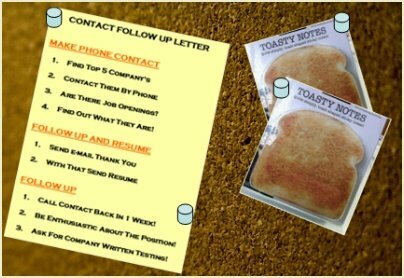 They will remember your phone call, and the letter helps recap the phone conversation with enthusiasm about how your resume skills fit this job opening. 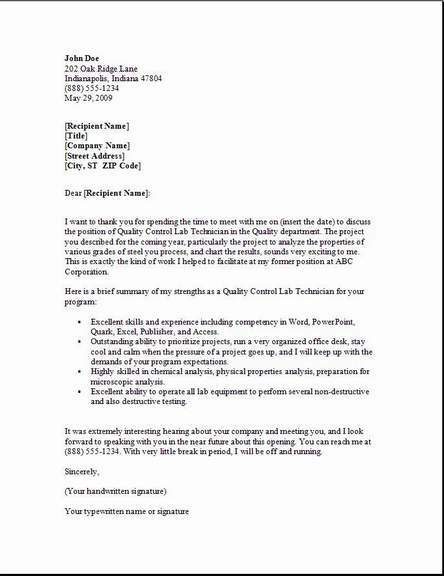 Your own Follow Up letter should resemble the one we have below. 1. This is easy for you to edit with word and modify the letter making it your very own!! I wanted to personally send out this thank you for our phone conversation yesterday at (John Doe Inc.). You graciously provided me with some very useable information regarding your customer service job opportunity. As you can see, my resume is enclosed, as I’ve looked forward to applying for this position for quite a while now. I also took the liberty to supply my references. As you will see on my resume, I have many years experience. If you could grant me the opportunity to go over with you in detail my qualifications, you will notice my best strengths are in this area. Please contact me at _____ or send me an email at _____. I'll be following up in several business days. I would really like the opportunity to talk with you in person. Check the company website to see what they do there. That way when you make phone contact you will have an idea of the type of jobs are performed there. It helps to write down some questions for the phone contact. Use these in your phone call to advance the conversation so you can find out what job openings they have or that are on the horizon. Again, you should contact the person again in a week. They may have more information by then and want to put you through at least their testing process first. • Most companies look at your resume then call you in for testing if they decide your skills fit. • You might prepare for this by trying to look some up online. • Once you get this far and feel confident you have passed the testing phase, then start practicing for the interview, because that will be the next step.